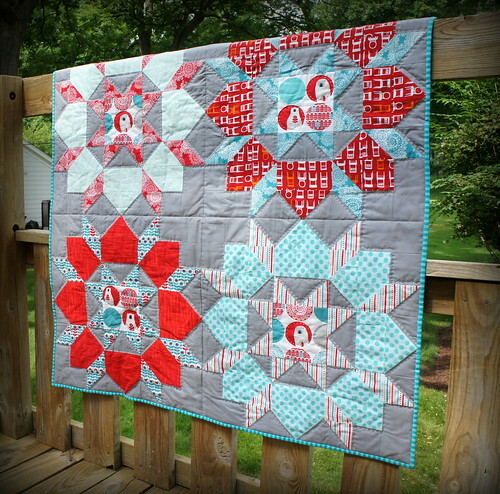 Baby Swoon – Brr! Style : Finished!! Eep! I finished it! Finally. 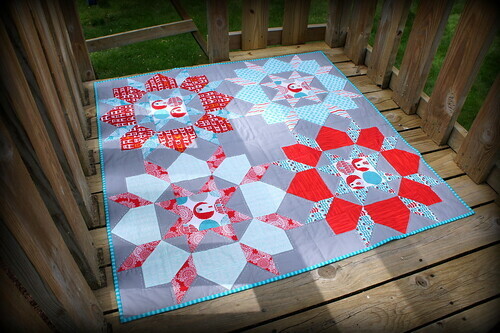 I’ve had this Baby Swoon quilt in progress for a long time, about a year and a half actually. I would have been done AGES ago if I hadn’t decided that this would be a good quilt to try out some hand quilting. I love the look of hand quilting, but my wrists did NOT love the activity. I’ve been given advice on how to make that better, but I think I’ll just stick with hand quilting as a little extra detail on pillows and smaller projects. Anything that has the word “quilt” as part of my description will not be getting a dose of hand quilting from me. Save the wrists! Save the sanity! I used mainly Laurie Wisbrun’s delightful fabric line Brr! for this in the aqua/red colorway. I supplemented those with some other fabrics I had in my stash that were in the same colors. There’s a Ta Dot in there, some Joel Dewberry and even other of Laurie’s fabrics. The background is one of those many Kona grays. No idea what the particular color is. I probably bought it at Joanns if that helps anyone. The backing is mainly Laurie’s Tufted Tweets Chairs in Red and the binding a fun Michael Miller stripe I bought on clearance at my local fabric store a while back. Stripes are always the perfect binding. The swoon pattern itself was fun but a bit frustrating because I kept picking directional prints…it’s definitely a lot easier when you are not worrying about direction of your print. And it grows quickly. So four blocks gave me a very generous sized quilt. Such a sweet little quilt. And I’m very happy finish up this UFO. Now I just need to find a home for it! It's fabulous! I recently finished a quilt using Brrr! too — it's a fabulous line, isn't it? This lovely line really makes lovely quilts. Well done! So adorable Angela!! 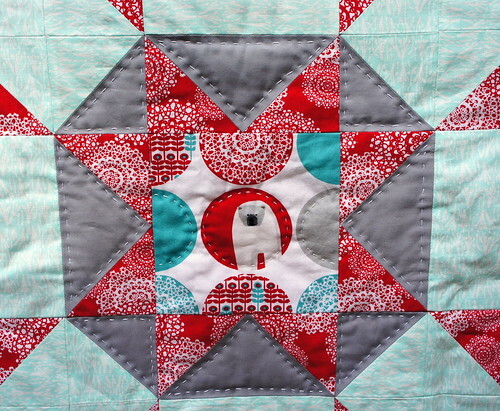 What a beautiful finish and your hand quilting is just precious! Ahhh, I do love that Brr, this looks fab! Congrats on this finish – it's gorgeous! Very sweet indeed! LOVE Swoon and Brrr too – what a great combo! This is beyond adorable. If the background is Joann's, I'm going to guess from the pic that it is medium gray. I used it on a t-shirt quilt a while back. From the peek, the back looks awesome. I have a big cut of that and I always thought would be perfect for a back! I hand quilt with the needle pointing towards me, it keeps my wrist in a very natural position. I also have an awesome square lap frame I bought when I was learning to quilt. 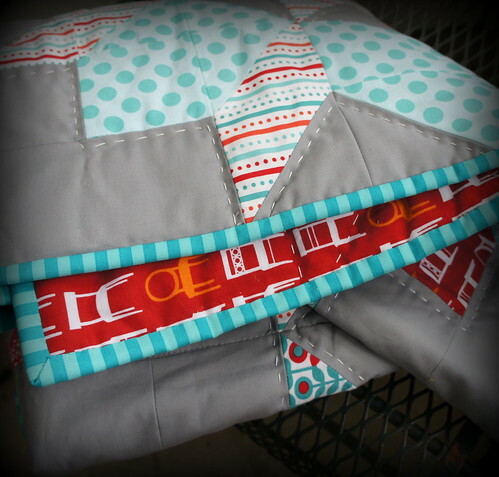 I think both types of quilting have their place, and there's nothing wrong with mixing both in a project. I always hurt my thumb joint and my opposite wrist. I still love it too. Just in smaller doses. Your quilt is very pretty. I love the circles quilted around the polar bears. So pretty! The handquilting looks amazing. Do you have a recipient in mind? Total awesomeness. The Brrrr is speaking to me – the icy cool palette is wonderful for swoon. Love love. It's a great looking quilt. I love the brrr line. That is A LOT of hand quilting and looks amazing. But I agree – it just takes too long and is hard work and maybe could be appreciated just as much on a small project. What a fabulous idea! I could swoon without coming to the big project. Lovely fabrics and colors. it's very cute. the hand-quilting makes it and brr is one of my favorite lines. It is absolutely gorgeous! I love the fabrics and colours, big time!!! Oh my gosh! So cute! I love how you used the tufted tweets on the blocks. That's beautiful — I love the colors! 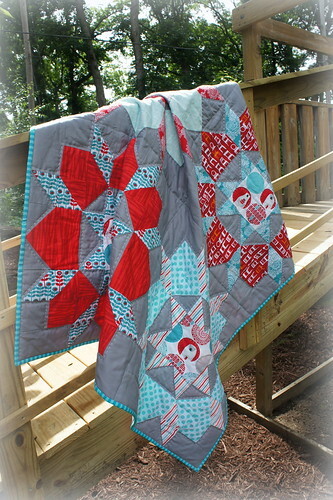 this is a great quilt, you gave me a great idea to make a mini Swoon, thanks!! Beautiful. 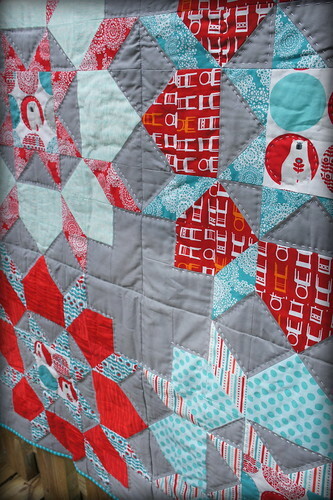 I love your use of gray for the backgroung, and the hand quilting works really well. I'm working on a mini swoon myself at the moment. I really love the patterna and will be definitely making a second as I really want to try out a dark background. I love that you hand-quilted this! It looks great–even if it is time-consuming!!! I remember this one! Sorry to hear that the hand quilting didn't work for your wrists. But, that said, I fully support the "this doesn't work for me!" policy. Sometimes everyone wants to help/force things to work because they like them instead of giving people space to like what they like. =) So, machine quilt on, my friend!